This article was originally published on the Evergreen Outdoor Center blog on October 10, 2005. Avalanches are acts of nature that are difficult to predict, even for the seasoned professional, and take close to one hundred and fifty lives a year around the world. (Schaerer, 1993). There are, however, many things that we – as backcountry users – can do to reduce the risk of being caught. We can also take precautions to provide for a better chance of live recovery if the unthinkable does in fact happen. A well planned trip is the foundation for success in the winter mountains. Seek information from maps, guidebooks, ski patrol, knowledgeable locals and guides. If you understand internationally standardized snow pit data, this can be found on the Japan Avalanche Network home page; www.nadare.net. Inform others of your plans, and fill out mountain itinerary cards when leaving a resort. Route finding is definitely something that comes with years of experience, yet there are some simple rules of thumb for travel in avalanche terrain. Slope angles of over 25 degrees can produce slides and 35-45 degree slopes prove to be the most dangerous. 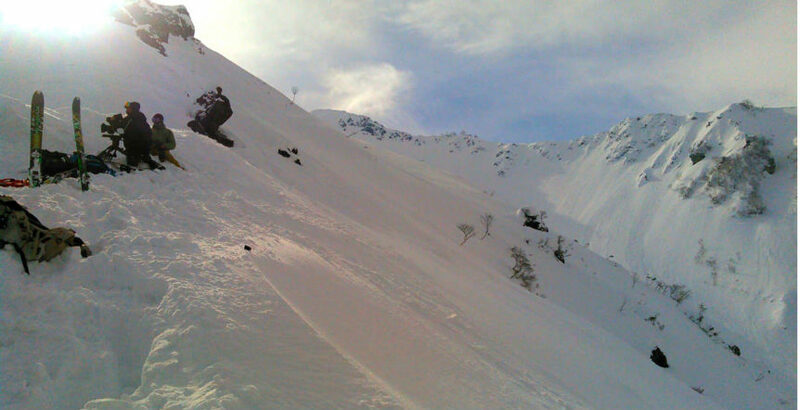 Large bowls and valleys produce large avalanches yet small slopes with deep snow can bury a person just as easily, especially when combined with terrain traps. Convexing rolls, cornices, wind-loaded slopes, unsupported slopes, openings below trees or rock outcrops and solar radiated slopes are all high risk areas and probable avalanche start zones. Terrain traps such as gullies, cliffs, trees and tree wells, rocks, creeks, crevasses and human structures all increase the risk of deep burial, injury and death. Slopes with such obstacles should be avoided if possible or at least acknowledged so as to plan an exit if anything goes wrong. Always take into account what is above you, whether it be others in your group, other groups, crossing avalanche paths or moving below cornices. When at all possible, stay away from avalanche terrain when traveling in the back country. Most groups are informal groups of friends and do not have a designated leader thus making decisions for the group a more difficult task. The best skilled at skiing or boarding may not be the best skilled at making risk-related judgements or terrain selection decisions for the group. Often those who are slower or less skilled riders will make better judgements based on their lower ability or tentativeness, but are often swayed by pressure from the more aggressive riders in the group. These people may just be following the tracks of those in front and may not recognize hazards around them. When traveling as a group, make decisions by the whole of the group based on the level of the ability of each member. If you know that you are going to ride advanced terrain, make sure that everyone in the group is at an advanced level in the back country mountains and not only the ski hill – as they are very different. Set obtainable goals for all in the group given the group’s weaknesses, weather conditions and snow stability. Good weather can often be a false security, enticing people out further and onto bigger and steeper slopes. Take into account any signs of instability, and voice your concerns to the group; you may just save the day and your friends. Don’t be scared to make the turnaround decision if conditions are found to be unstable or uncertain. If in doubt, turn about.